It’s hard to imagine a more picturesque alpine setting than the Gastein Valley in the heart of the Austrian Alps, an hour west of Salzburg. Flanked by the magnificent Hohe Tauern mountain range, the valley is home to three spa towns, each with its own distinct Austrian charm. 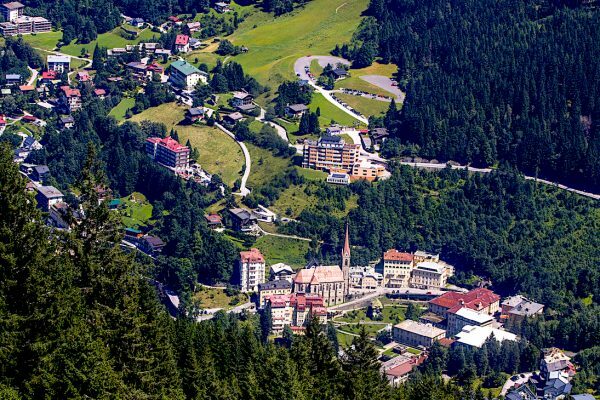 The Gastein is known for its belle epoque hotels and villas built on the valley’s steep, forested slopes. It offers excellent skiing as well as many other outdoor sports, but probably its biggest attraction is its world-famous hot springs and radon therapy. Back when mining was an important industry in the valley, underground gold and silver miners began noticing improvements in symptoms from various ailments, including arthritis. 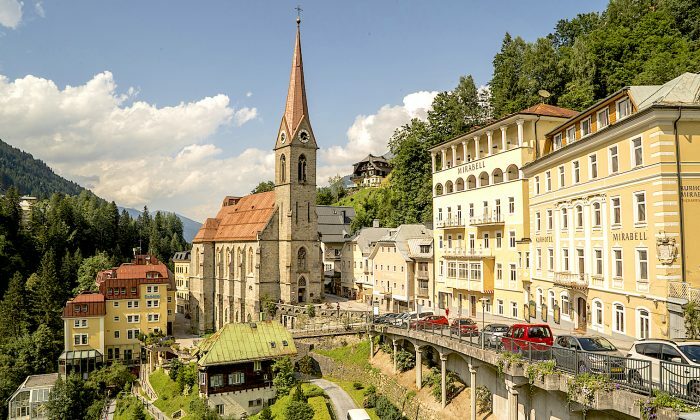 Further investigation into the healing effects of radon, a colorless gas, led to the establishment of radon therapy centres in the area, including the Gastein Healing Gallery in the town of Bad Gastein. I boarded the small train that ferries people to the tunnel—originally dug by laborers in search of gold—and tried the therapy. Lying on one of the beds that line each side of the tunnel, I breathed in the radon-enriched air. I didn’t notice anything right away, but a few weeks later the hip and back pains that had been nagging me disappeared. I wondered if it had anything to do with the radon therapy. 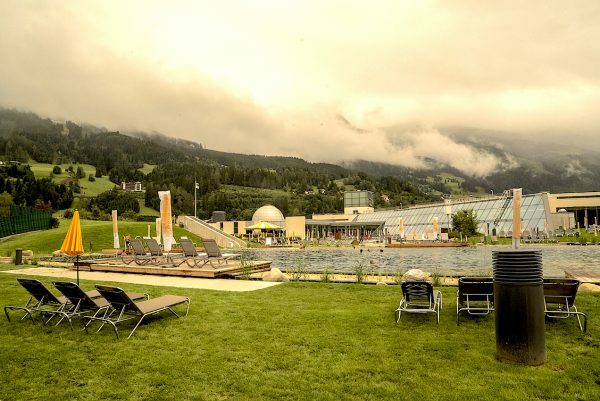 Although Radon therapy is a relatively new venture, the Gastein has been known for its thermal water springs since Roman times. The foothills of Graukogel mountain is blessed with 18 different springs—the result of rainwater trickling from the mountain peaks and collecting dissolved minerals in its path—with temperatures ranging from 44 to 47°C. 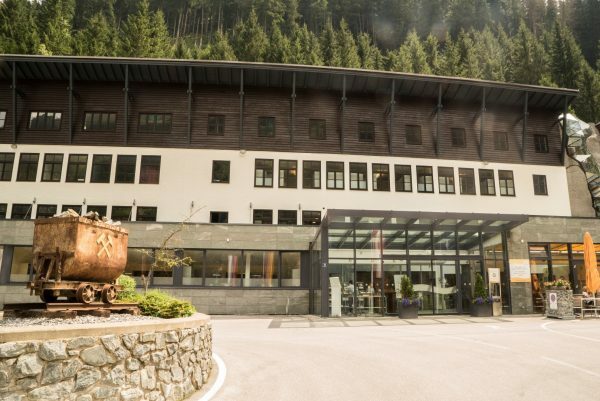 The thermal water, which has both minerals and radon in it, is supplied to local hotels and spa centers from a pumping station in Bad Gastein. 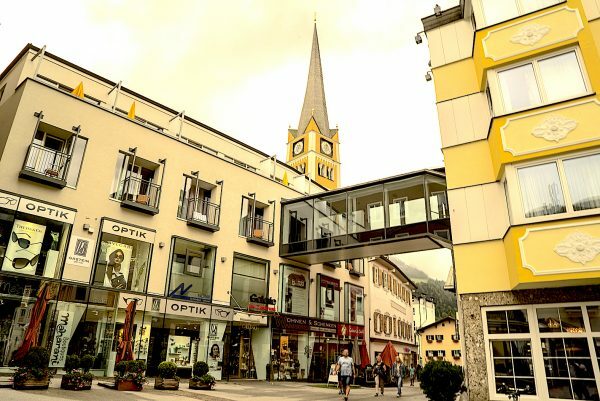 This natural resource has helped greatly in developing the reputation of the three spa towns: Bad Gastein, Bad Hofgastein, and Dorfgastein. 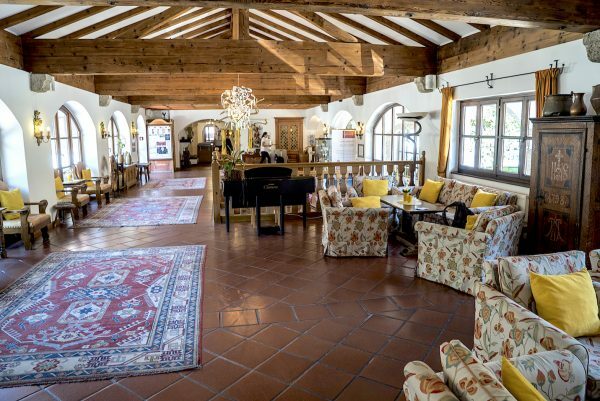 As a result there are many luxury hotels and spa centers offering treatments and radon therapy. 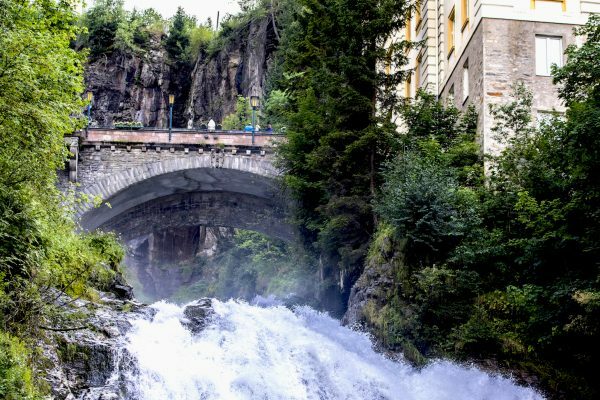 One of the highlights of Bad Gastein is a splendid 340-metre-high waterfall in the heart of town that drops three levels as it cascades into the creek below. A nearby stone bridge provides a good view of the falls, but I headed along one of the hiking paths until I reached the second level of the waterfall, where I stood and quietly watched the water crashing down. Listening to the sound of the falls and feeling the therapeutic spray on my face proved to be a special moment. 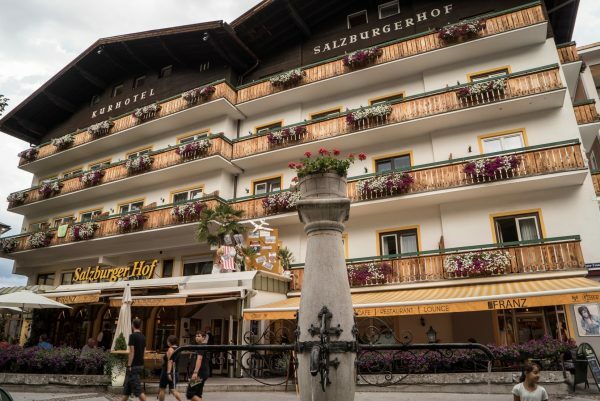 I stayed at the St. Georg Hotel in Bad Hofgastein. A must-experience here is Alpentherme, a public spa in the heart of town. This newly renovated state-of-the-art facility is a health rejuvenation complex with several fun indoor and outdoor pools for adults and children, as well as jacuzzi and steam rooms with different temperature levels. It also provides various treatments including radon baths. A unique feature of Alpentherme is its man-made lakes. 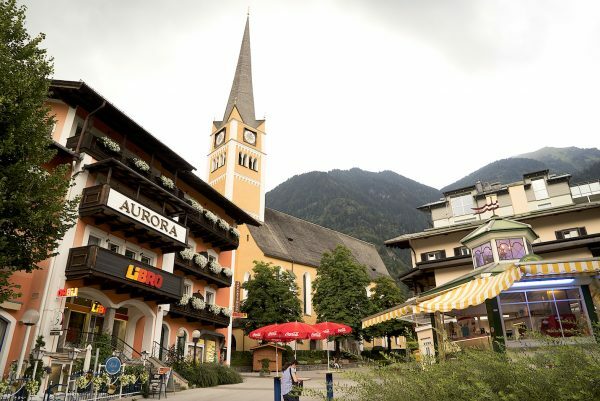 Bad Hofgastein is a cozy, boutique-style town and an ideal holiday spot for all ages. Despite it’s being a modern spa resort, I felt that the town has maintained its traditional character. For the adventure-minded, a quick and easy way to get a bird’s eye view of the forest and the waterfall is by ziplining from one side of the valley to the other. Hiking is also a popular activity in the valleys and mountains. I took a cable car at Stubnerkogelbahn in Bad Gastein to the summit of Stubnerkogel, legendary for its mountain skiing and spectacular views. Upon arriving at the summit station, you step onto a 140-metre suspension bridge, made of wire mesh. It connects the station to the opposite mountain. From there I followed the hilly path along the edge of the summit—the deep valleys on both sides leading to higher peaks. Despite it being a sunny day, the peaks were covered in clouds. I also took a cable car to the mountainous pine forest of Graukogel. The cars take you up to a height of over 1,900 metres, soaring above trees that are 200 to 300 years old. The summit of Graukogel is at the top of the forest, and the hiking here—in contrast to the open-field landscapes of Sportgastein and the Stubnerkogel—is more exotic as you walk in woodland, which is rich with vegetation and flowers. Going deeper into the forest, we came across several small treehouses built for observing the wildlife. 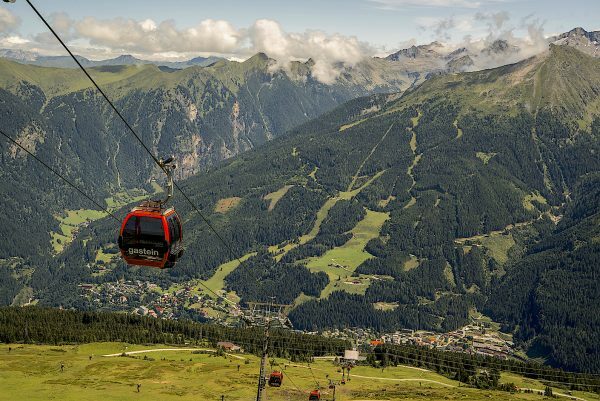 The Gastein Valley is more than just an upmarket spa resort. It’s a year-round destination attracting skiers in winter and early spring, and hikers for much of the rest of the year. For me, what made it so appealing aside from the scenery is that when I left I really did feel rejuvenated and relaxed. It has to be more than just the mountain air!